On my old android 4x, Jarvis 16.3 box, with the master phone socket in another room I often had problems with buffering on SD streams (though pausing for a minute usually helped as it enabled the stream to make headway), watching HD streams was out of the question (tu I don't care as I don't have a HD TV), and whenever I took a stream off pause it would play in silence for 30 seconds before the sound would return. I'm talking Genesis/Exodus and now Covenant. Since getting the master socket moved into the TV room, just 3 feet from my brand new android 5x box with Krypton 17.3, things have been much better. Buffering hasn't been an issue on SD, I could even watch HD streams for a good 10 minutes before they freeze-up and I had instant sound whenever I unpaused a stream. In short, life was good. However this past week I am having problems again. ALL streams are buffering within 2 minutes and the 'progress' bar (for want of a better phrase) doesn't push on and put distance between it and where playback currently is. Not even pausing it - to allow the stream time to forge ahead - makes much difference. At first I thought it was the stream itself (new movie, not many streams, lots of users hogging bandwidth) but it's happening all the time. Even when there are a ton of streams. I've cleared the Covenant cache even though Smash periodically tells me that it's doing that automatically and I've cleared the cache in the android box internal storage settings, too, but to no avail. Ps: I've just run a speed test and I'm at 44mb DL and 17mb UL. No parental blocks by my ISP (BT). are you running a build? do you have a ton of addons? you said you have tried multiple source sites for streams, correct? Just checking, you have colossus repo installed and running the newest version of covenant, correct? If your internet connection is ok you might try creating an advancedsettings.xml file to increase the amount of cache that Kodi uses for buffering. Save this as advancedsettings.xml in your Kodi userdata folder (location depends upon OS) making sure that the file extension is xml and not txt or anything else. Then restart Kodi. Just Krypton 17.3 build - no Wookie or Beast or whatever. I have 6 add-ons - mainly because most of the good ones have gone away (Los Movies, Movies25, Ice Films, Velocity etc) or optimised builds that pre-load and configure a host of top add-ons. I have Covenant and a handful of non-working shite: Elysium, 1 Channel (supposedly fixed for the UK but it isn't), 1080 movies and TV Player but none of these work. As Fusion is no more, when I got my new android 5x box (to run Krypton) I got Smash & Colossus as well as noobsandnerds, Elysium and kodiaddons. I picked from these the handful of add-ons I thought were good (Covenant) and were willing to try after hearing good things (the others). I am running Covenant v 1.1.23 from Colossus (in which case I can't remember why I installed Smash). I clicked 'update' but it's still 1.1.23 so I assume that is the latest build. I have no coding sills and have never amended anything on my box - this looks scary! The buffermode value of 1 just tells Kodi to buffer all filesystems, both internet and local. From your shiny new Android box, open a web browser. Send it to speedtest.net and see if your download speed is close, within 4-5mb of what your connection is rated at. I believe you said 45mb...I'm thinking, since you are using wifi, you may have an issue with other wireless devices causing interference. Like, cordless phones, baby monitors or anything that is wireless. If you have another PC or laptop that is connected by WIRE see what speeds it can attain from the speedtest. Both should be close to each other. If your new box is getting less than about 35mb and your wired device gets you closer to top speed more than likely you got a wifi issue. If you do have anything that is wireless turn it off or unplug it then test again and see if it improves. I used to have an issue on my system with wireless rear speakers on my surround sound system. Once I figured out they were causing problems I fixed it by changing the wifi channel in my router to avoid the channel those speakers were on. It's a process of elimination. "telephone socket to within 3 feet (but still wi-fi)"
a cat5 connection would be the BEST way to avoid issues of speed and RFI (Radio Frequency Interference). BTW I have never seen any improvement in buffering by altering the advancedsettings.xml file. Not to say that it doesn't work, it just didn't do squat for ME and I doubt it will help you but it is worth a try, who knows you might get lucky! Generally if you get a video that hangs like what you describe it's a server issue and so you just have to keep trying other sources for that video until you get one that's good enough to stream it correctly. Speedtest would only let me do it if I DL the app so I went to Which broadband checker (33mb DL / 19mb UL); broadband.co.uk (35mb DL / 9mb UL) and broadband speed checker (19mb DL / 17mb UL). I'm thinking, since you are using wifi, you may have an issue with other wireless devices causing interference. Like, cordless phones, baby monitors or anything that is wireless. Nothing has changed though from when I was playing SD just fine on my old andoird box and this new one up until last week. I have my box, home phone (wireless but is always sat on its charger), mobile phone and laptop. If you have another PC or laptop that is connected by WIRE see what speeds it can attain from the speedtest. Speedtest.net has just returned 41mb UL and 17b DL for my laptop (with 4 internet windows open including a You Tube video on pause). MY laptop is currently 15ft away from both the box and the master socket as it is in another room. Both should be close to each other. I wish speedtest would run on my box but like I said, it was app only. If your new box is getting less than about 35mb and your wired device gets you closer to top speed more than likely you got a wifi issue. If you do have anything that is wireless turn it off or unplug it then test again and see if it improves. I used to have an issue on my system with wireless rear speakers on my surround sound system. Once I figured out they were causing problems I fixed it by changing the wifi channel in my router to avoid the channel those speakers were on. It's a process of elimination. Don't know what to say to this. "telephone socket to within 3 feet (but still wi-fi)" a cat5 connection would be the BEST way to avoid issues of speed and RFI (Radio Frequency Interference). 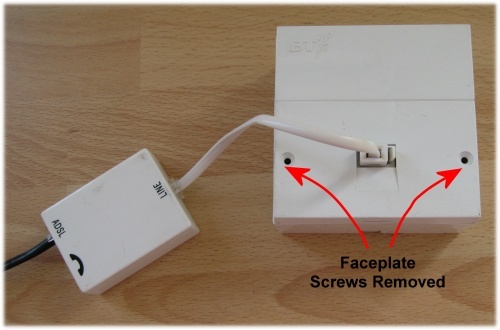 I wanted to do this as my box does indeed have an RJ45 port - and this was the reason why I had my master socket moved into the front room and close to the box - but the problem is my telephone socket has this thinner connection and I don't recognise the type. From this socket is a micro filter with 2 ports (one use by my hub and the other by my land line) and whilst I'd be happy to hardline the box up, I don't know of any cables that go from RJ45 to this thinner one that BT use. This is not my socket but this is exactly the type of setup I have. Thinner/flatter connection than the square RJ45 and micro filter with the exact same connection port. It may be an RJ11 but I am not sure. You can get around having to download the speed test app..I just don't remember how. Maybe a different browser. But the app is safe I use it with no issues. Pick a location that is nearest to you. Use the same test point/location if you can on the laptop and the device. Run it several times. I would say unplug the cordless phone AFTER you get some speed tests from the Android box. See if the speed is affected while it's unplugged. Those things are known to be a problem particularly if it's 2.4ghz or a 5ghz phone because those are the same radio frequencies used by most routers. In order to ‘hardwire’ You box to test for better performance you need a cord with rj45 connectors on each end. One end plugs into your box, and the other end plugs into your router. Your wireless router is plugged into your modem. The router should have ports on the back for Ethernet, that’s what your looking for. Sorted with the ethernet cable that came with my box and now it's plugged into the router which is about 15 inches away from the box. Yes but remember, my problem in this thread was not about my inability to watch HD but SD content. To make matters worse, whilst on most streams the lack of stream caching ahead of the playback marker meant buffering, there were no issues with playback on a handful of streams despite no caching being evident and that really confused me. I turned off HD streams last week - after all, what's the point in seeing them if I couldn't play them and even if I could, I don't have a HD TV to show them off? I'll turn them back on tomorrow and test now that I have the cable plugged in. As a side point, prior to turning 1080 and 4k sources off, searching for streams for a film brought up a pop-up box that would measure progress in percentage whilst it collected the streams. Since turning them off, the percentage has disappeared and replaced it with listing the number of streams per bitrate - ie: 4k: 0; 1080: 0; 720: 15; 480: 25 - any idea why this has happened? I'm also seeing streams with .mp4 extensions whereas previously it was just HD/1080/SD. The 4K:0 1080:0 720:48 etc is just part of Covenants latest update, nothing wrong there. As far as your cache goes you would need to make an advancedsettings.xml file. Right, so hardlined and with speeds of over 70mb I went to watch season 3 of Project Greenlight. No HD source was available so 720p it was. I expected to see the cache streak all the way to the end within seconds of starting playback but nope, not even the usual 2-3 inches I used to get via wi-fi. Playback was okay only until 12 minutes in. Then the picture juddered and then froze altogether. I paused playback and 3 minutes later was able to restart it but only for another 10 minutes. And it kept freeing up every 10 minutes. . The same happened regardless of stream or episode. On the other hand, The Babysitter (2017) played flawlessly even though I still didn't see the cache ahead of the playback marker so now I am totally confused. I have managed to find my one and only HD source - The Dark Tower and it payed fine until 22 minutes where it froze and the onscreen timer/clock graphic appeared. ]As far as your cache goes you would need to make an advancedsettings.xml file. So is my problem a cache issue? Up until starting this thread things were fine even though I was limited to SD. My experience has been that if the cache is far enough ahead of the playback marker as to not be catchable - even if just a a bit as I usually get - then viewing is bufferless and those that aren't ahead of the marker, have playback issues and I have to wait for the cache to jump ahead. Yet in the past week or so I've had no caching and shite playback (which prompted this thread) and no caching but flawless playback. WTF??!! On another note, I am not sure why I am not seeing HD sources anywhere despite turning them back on (and even reverting back to defaults). Apart form the Dark Tower (of which there was just one HD source) I max out at 720p. This is from the site I linked to above. Have you read that page? Have you made a file? My bar is always barely ahead of the playback marker and I don’t have any buffering problems 97% of the time. Like I posted above I have created an advancedsettings.xml file and I consistently have 100% buffer and 170mb-200mb of cached video. This is server dependent though so you have to choose a good source like GVideo, CDN, OpenLoad, etc. I use the Rapier skin which has an option to display "debugging info" on screen (I don't know if other skins have something similar). This allows me to see the buffer percentage as well as the "forward" (ram cached video) amount and other info as well. If a source is not performing I choose another if possible. I rarely have buffering issues even though I'm only at 15Mb/s network speed! The server loads on the sources varies not only from source to source, but video source to video source, i.e. if Onseries/Estream is listed three different times the quality of the stream of each is different. Also, if you watch during peak hours expect higher server loads and possible buffering on lower quality sources. The stream quality may also depend on the physical path from server to box. Some shows I watch don't have any decent sources so I download them and watch them later.